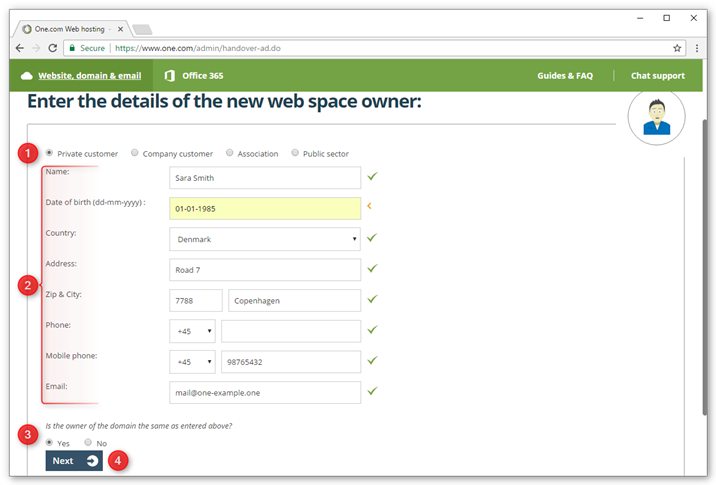 You can change the owner of your domain and web space subscription from the control panel. In some cases it's not possible to do it online, instead you need to use a PDF form. It will say in the control panel what method to use. You can find the form in the control panel, or via the link below. 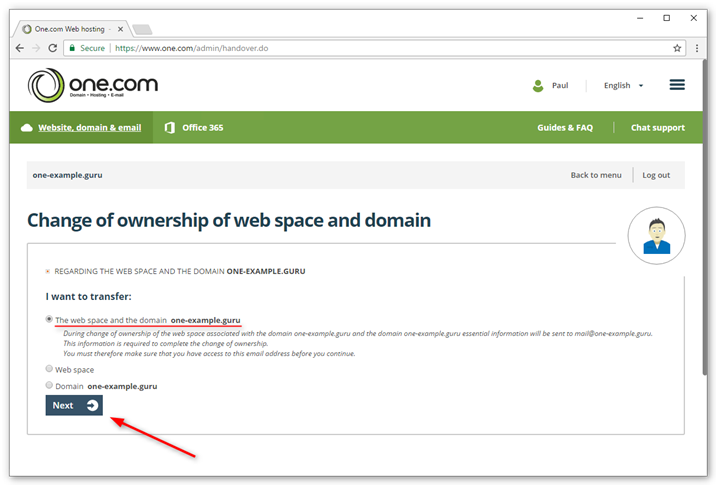 In this guide we show you how to change the owner for both the domain and web space subscription, when both are registered on the same legal entity. 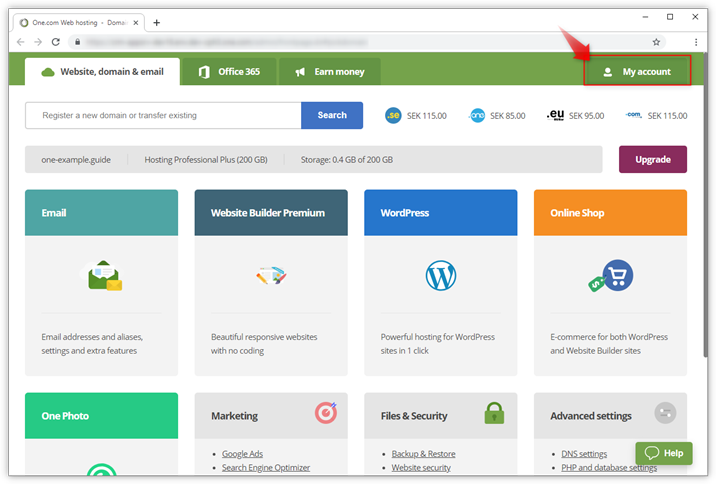 You can also select to change the owner of either the domain, or the web space and they can have different owners. In those cases the procedure will be slightly different. Please, contact our support if you have questions about this. At the top of your screen you see the current details for your domain. Scroll all the way down and click 'Change of ownership'. 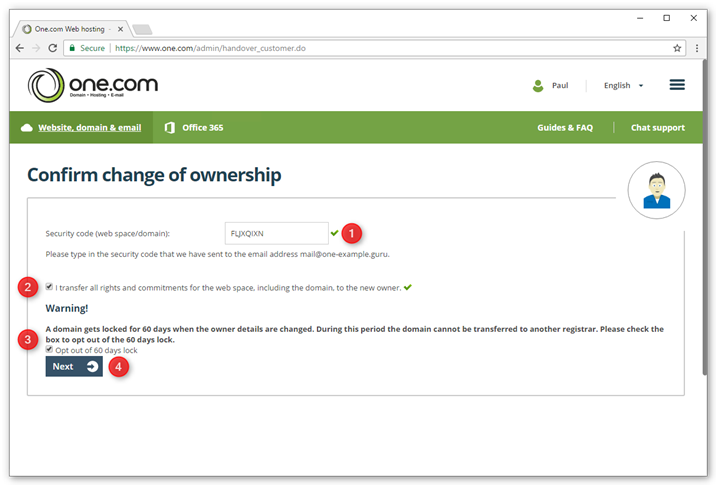 Note: If you manage more than one subscription under this user, you need to select the domain you want to change the owner for, from a drop down menu. 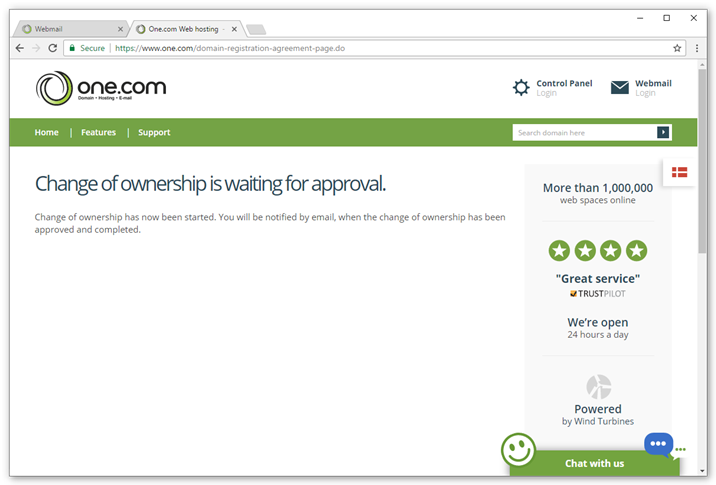 You need to choose if you want to change ownership of the domain, web space subscription or both. In this guide we change ownership for both. Select your preference and click Next. Select what type of customer the new owner is. Enter the name and contact details for the new owner. 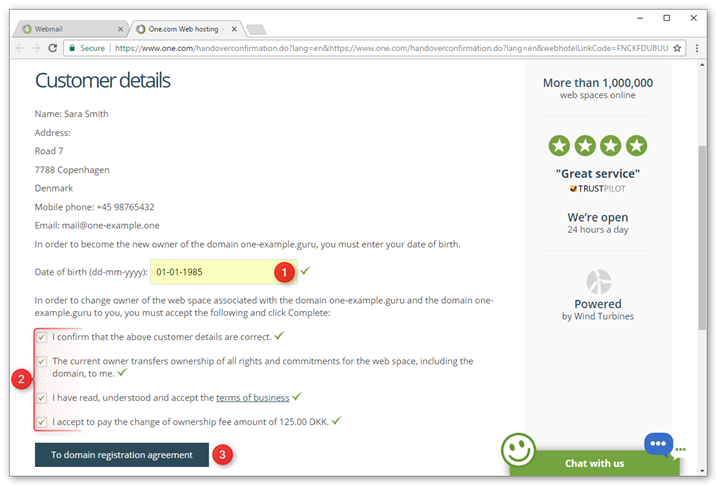 Select whether the new owner for the domain will be the same. In this guide we selected yes. An email has been sent to your contact email address with a security code to validate that you are the owner. Open the email in your inbox and copy the security code. 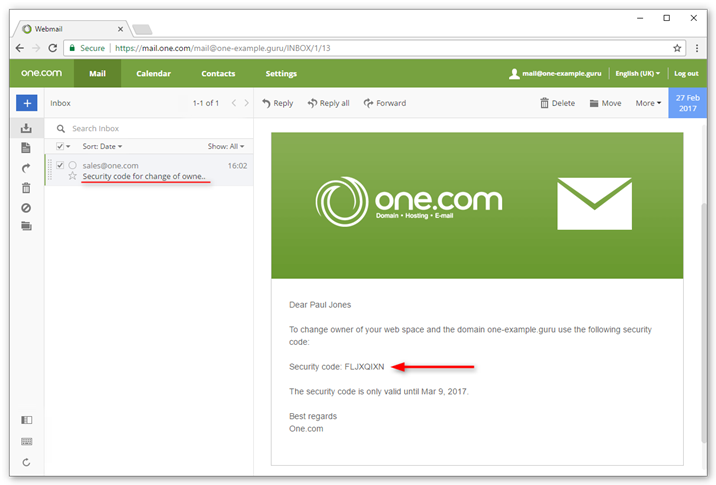 Note: If the email address registered for the domain is different from the web space subscription, two security codes will be sent, one to each address. Paste the security code in the designated box. Check the box to confirm that you want to transfer all rights. If you change owner of a gTLD, you need to choose if you want to opt out of the 60 days lock. Note: The following steps need to be done by the new owner. An email has been sent to the email address of the new owner. 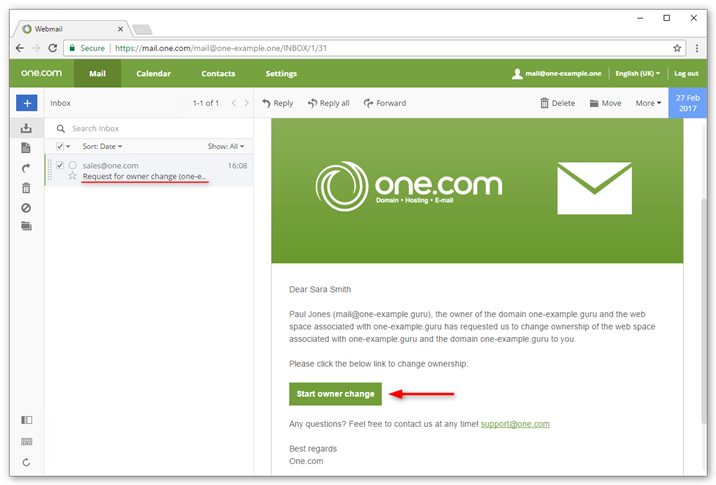 Open the email and click Start owner change. At the top of the screen you see your customer details, please check if everything is correct. 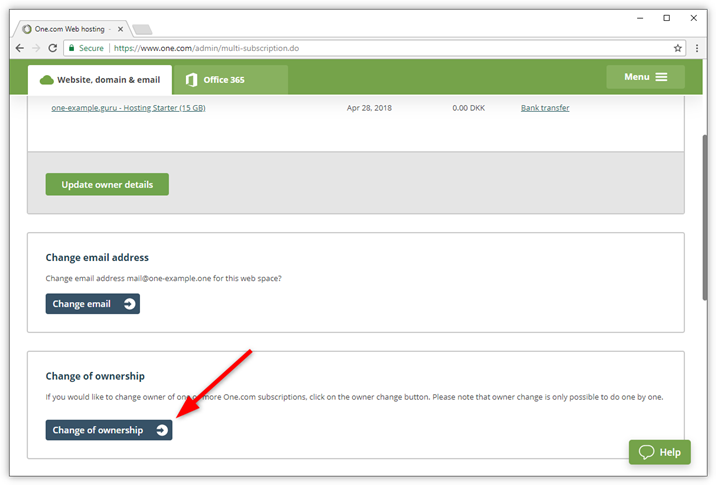 Accept the terms for the owner change, including our terms of business; you need to check 4 boxes. Click 'To domain registration agreement' to continue. 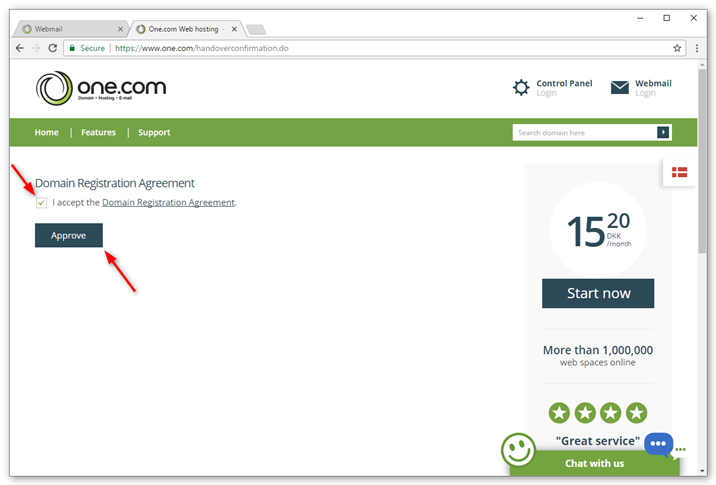 Check the box to accept the Domain Registration Agreement and click Approve. Note: This step is only part of the procedure if you are changing the owner for a generic top-level domain. Your owner change request is now being processed. It may take a couple of days before it is approved. As soon as it has been approved, both the new and then previous owner will receive a confirmation via email. The new owner will also receive an invoice and login details. Tip: If you haven't received any email from us after 3 days, we recommend you to contact our support.